Summary: “‘A line that should never be crossed is about to be breached. It puts this entire castle in jeopardy—and the life of your friend.’ From the throne of glass rules a king with a fist of iron and a soul as black as pitch. Assassin Celaena Sardothien won a brutal contest to become his Champion. Yet Celaena is far from loyal to the crown. She hides her secret vigilantly; she knows that the man she serves is bent on evil. Keeping up the deadly charade becomes increasingly difficult when Celaena realizes she is not the only one seeking justice. As she tries to untangle the mysteries buried deep within the glass castle, her closest relationships suffer. It seems no one is above questioning her allegiances—not the Crown Prince Dorian; not Chaol, the Captain of the Guard; not even her best friend, Nehemia, a foreign princess with a rebel heart. Then one terrible night, the secrets they have all been keeping lead to an unspeakable tragedy. As Celaena’s world shatters, she will be forced to give up the very thing most precious to her and decide once and for all where her true loyalties lie… and whom she is ultimately willing to fight for.” (Summary found on Goodreads). Crown of Midnight by Sarah J. Maas blew my mind. Throne of Glass was good, but not outstanding, especially with its occasional boring points. 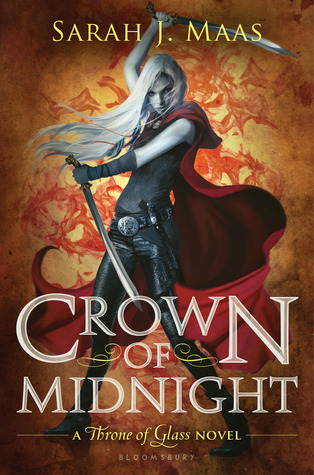 However, Crown of Midnight was excellent and I wasn’t bored in the slightest. I actually began to love Chaol (name pronounced like “kale”) so much more in this book. Maas creates such wonderful and in-depth characters that you can’t help but falling in love with, honestly. She created a superb main character, Celaena, who is strong, brave, and smart. She is self-confident, which is a must in young adult books, and isn’t afraid to speak her mind. More strong female characters, like Celaena, are needed in young adult fiction. Also, Maas’s writing is really good. At some points it can be a little confusing, but I definitely enjoyed the way she writes more than in Throne of Glass. With that said, there were some minor faults. There is a lot of violence and more romance than previously, but violence is expected in fantasy and romance is expected in young adult books. Also, as previously mentioned, I found some parts confusing. There are a lot of complex fantasy elements, city names, and detailed information about characters that if not read carefully and thoroughly, will be quite confusing. However, I managed to figure out what was happening, so I didn’t drop the rating. I definitely recommend the Throne of Glass series to fantasy lovers. I have my fingers crossed that the next book (Heir of Fire) is just as good as Crown of Midnight, if not better! Also, here’s a quote that I love from Crown of Midnight: “And isn’t the journey more important than the end?” -Mort, page 282. Did anybody else just love the talking door-knob?